I was 29 years old when I had my first bowl of Pho soup. 29!!! Clearly, my parents did me a huge disservice but not introducing this soup to me at a younger age. On the flip side, both of my children were under the age of 1 when I first introduced them to this yummy soup. And, speaking of children, you may have noticed by the picture that this isn’t quite the traditional Pho soup (I don’t think I’ve ever had carrots in my Pho, other than at home). But, hey if it gets my kids to eat it then I’m adding carrots! And shiitake mushrooms…. well those are actually more for me but hopefully you get the point that this soup can be catered to your family’s unique tastes! In our home, I typically add carrots, shredded green cabbage or bok choy, and of course my precious shiitakes. 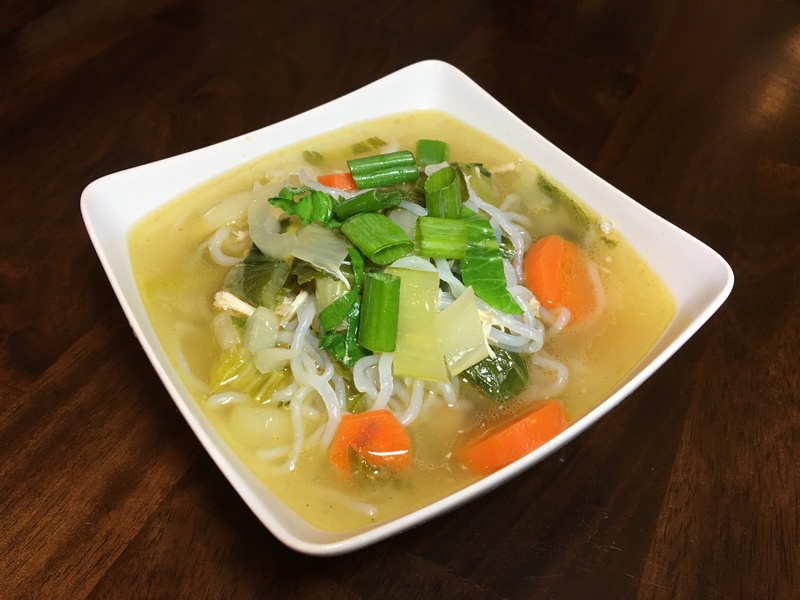 I also use the Shirataki low carb noodles to make this soup Keto and Paleo friendly. You can also make this soup low FODMAP and nightshade free making it one of the only soup recipes that virtually EVERYBODY can enjoy! Veggies of choice: Get creative by adding bok choy, shredded cabbage, bean sprouts, shiitake mushrooms and even carrots. While these aren’t all traditional additions but I’ve found they all work really work in this soup and make it a little more kid-friendly. For low FODMAP, I recommend boiling the onion and whole garlic cloves in the broth for 10-20 minutes to get the flavor of the onion and garlic into the broth, then remove and add the remaining ingredients. This shouldn’t cause any GI symptoms but adds some great flavor. 2. Add broth and water to large saucepan or crock pot (I typically make this the crock pot). Add onion, garlic, anise, cloves and ginger. Bring to a boil and allow to simmer 5-20 minutes. 4. Add fish sauce and veggies of choice and cook just until tender. Add noodles. 5. When ready, add soup to serving dishes and top with garnishes of choice.